The best place to get coupons is the Sunday Newspaper. The Dallas Morning News (DMN) now costs $3 – that $3 will save you a LOT! You can also buy a double pack of newspapers bundled together for $5 – save 50¢ per paper and you get twice as many coupons! I usually buy 2-4 newspapers per week in order to have multiples of coupons. If I need more copies I can always order them from a clipping site for a small handling fee or trade for them on a coupon trading site. Be sure to check out the Sunday Coupon Preview each week to see which coupons will be in the paper. You can also find coupons in magazines. All You is a magazine sold only at Walmart and it almost always has great coupons in it. Can u.use more than one coupon on one ideam? It is a limit of one manufacturer’s coupon per item purchased. 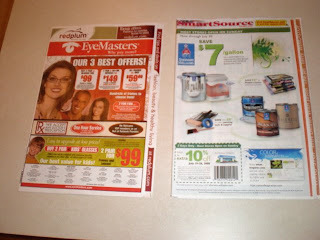 As I’m learning about couponing and reading up on ideas as to how I can obtain coupons, I made a visit to my local post office to find out what they do with all the extra circulars as we get redplum via mail every week. They informed me that the circulars come on Wednesday and they issue them on Thursdays. They said they cannot hold them for anyone, but that I was able to take as many as I wanted as people that had post office boxes would just throw them away. Yes, that means taking them from the trash bin, but since most people are only in the post office for 2-5 minutes it’s just mail in the bins. So if you don’t mind taking some off the top of the bin it’s a great source for circulars. I bought a year’s subscription for the Seattle Times Sunday paper for $30 on Groupon. I don’t know if it’s a common thing but it’s definately worth looking into, it was such a good deal. Hi I’m trying to become a coupon shopper but I don’t know what stores to go to and what sites to start from I live in Chicago and it seem like it’s a lot of stores they don’t take coupons so can somebody please help me:-(…. As an additional source to get coupons, besides dumpster diving, you can try two things that worked for me. One I went to a local apartment complex and left a manila envelope for unwanted coupons. I ran into a few people while I was setting them up and asked people if they could please put their unwanted coupon inserts in the envelop on sundays, its actually worked quite well, just make sure you check with the renting office too. Also the majority of CVS and Rite Aid stores, possibly some other small drug stores, just buy packages of the papers and any they don’t sell by the end of the day they toss. So if you can talk to the manager they may be willing to hold on to any leftovers for you, or sell them for a nominal fee as opposed to the full sunday paper price. I was recently at the local Dollar Store and was shocked to see that they had the Sunday newspaper for $1. The coupons that I used from it saved me $34. Im fairly new to couponing, but so far love it. I have a question, I watch extreme couponing and often see people buying like 200 of the same item. Where do the people get the 200 coupons? I would like to start saving like thembut of course cannot afford to but 200 newspapers. Please advise. I went and bought the Sunday paper multiple times and there have been no coupons in it in my area. I am trying to dig into the internet and find them but half the time I am afraid to go to a specific couponing site because I am afraid they are fake. I really need to start couponing and have researched it so much but I am still lost. Any advice? Does anyone else have issues printing coupons on a mac? I feel like I’m missing out because every time I try to printing coupons I get something saying it’s not compatible with my browser and OS. I redownloaded Safari for the sole purpose of printing coupons (it’s the only one that coupon printing things say are compatible when running on a mac) and it still doesn’t work. I am new to this and bought the Sunday paper but there were only 3 coupons in the whole paper??? We are trying to start couponing but we don’t know how to start. We would like to know some tips. Very new to Couponing! I have a question about Internet coupons. If I print the same coupon from 2 different computers can I still use them? Here’s an example: $1.00/1 box cereal. If the limit for IP coupons is 2 per computer, then can I print off 2 IP’s from each computer for a total of 4 IP’s and buy 4 boxes of cereal at $1.00 off of each? @Stosha, Yes, you can print multiple coupons if you have multiple coupons. I am new to couponing and am wondering about sites that have printable coupons. I have read the privacy policies on them and even though they claim that they do not use Spyware/ Adware, they do say that they install a program on your computer that is tracked to prevent coupon fraud. This stays on your computer even after you un-install it. Has anyone had any problems with these sites, or any issues with your computer’s operation? @Claudia, I have not had any problems with the coupon printing programs. What are some of the websites that will mail coupons for a handling fee? I have tried searching for some online and don’t know if they are trustworthy. @kimme, i have made that mistake of throwing coupons away too.. but then i found out that thre is a coupon swap bin at my public library where you bring some and take some !! Wow that is great! I wish we had something like that too! It might be worth checking though. Thanks for sharing that tip! I know!! I was in serious shock when I bought my papers on Saturday! $5 is almost double the price! I guess newspapers are really hurting right now to have to raise their prices so much. Wish I could get the Star Telegram here! @Stephanie, Do the DMN & Star Telegram have the same coupons I wonder? If you have the option of buying both, should you? Or should you just stick with one? @Cecilia, I am not positive. They will probably have very similar coupons though there might be slight differences. @Cecilia, i have found that they do have the same i have been buying since i started couponing at the begining of the year i have not yet seen a diffrence in the coupons. The price of the newspaper is going up (along with everything else). I went into the store this weekend expecting to pay $3 for the double pack of DMN and it is now $5. That is quite a hike in prices. I went ahead and returned them and bought the Star Telegram instead ($2.89 each) That was quite a bit of savings in itself! I usually post a disclaimer at the top of the post (I somehow forgot this time, I will add it right away) that you should use a free email address (yahoo, gmail, hotmail) specifically for freebies and samples. This way, if there is any unwanted email it will go to your “deals” email and not your personal email. But, just to let you know, I sign up for all the deals myself. So far, my “deals” email has not had any spam. I only check it once in a while and I only ever see the newsletters that I sign up for in order to get the deal. And those newsletters have an “unsubscribe” link if you don’t want to receive the emails anymore. Great website! All these coupon websites want your email address. Doesnt that open the door for mega spam?? Great website. All these sites require giving out email addressess. Doesnt that open the door for mega spam?? @Jamie, Create an email just for couponing .